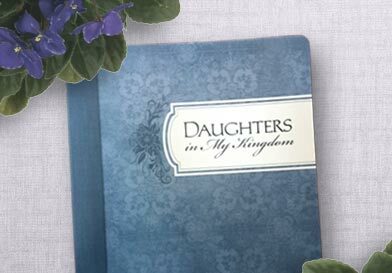 Yesterday, in church, I received a brand new book...Daughters In My Kingdom. Did you receive it as well? What is it? Daughters in My Kingdom is an official publication from the Church of Jesus Christ of Latter-day Saints detailing the history of the Relief Society. The teachings, stories, and examples in this history book will guide you in establishing priorities and practices in your life that will help increase faith and personal righteousness, strengthen families and homes, and seek out and help those in need. The Website - You should visit the beautiful website that accompanies this new book. It has great quotes, inspiration and (my favorite) stories from real Latter-day Saint women who have used the principles taught in Relief Society to help them weather life's storms. Visit the website by clicking here. Download a Copy - If you sis not receive a copy of this wonderful book yesterday you can download a pdf copy on the website by clicking here. At the bottom of the page on the left hand side you'll see a graphic of the book and a tab beneath that says "Download". I cannot wait to read this book. I know embarrassingly little about the history of Relief Society, but have always loved it. I love the fellowship with my sisters in the gospel, I love the acts of service we perform and I love the gospel truths I learn each week in Relief Society. Do YOU have a copy of Daughters in My Kingdom? I love this book I have been reading it every day from the moment I got it. I am so proud to be a daughter of God, I am so grateful to be in the Relief Society and to be able to help others in this lifetime. I didn't--I wonder if they forgot to bring it to Primary? I have loved this book too. I didn't know much about RS either, but I feel a greater testimony of the program since reading the book!